If women activists are to be successful, it will be from understanding and utilizing the strategies of other successful resistance movements, led by women, both throughout history and in present time. This success must become the lifeblood of our own movements. The Pink Sari Gang of India is one such movement. 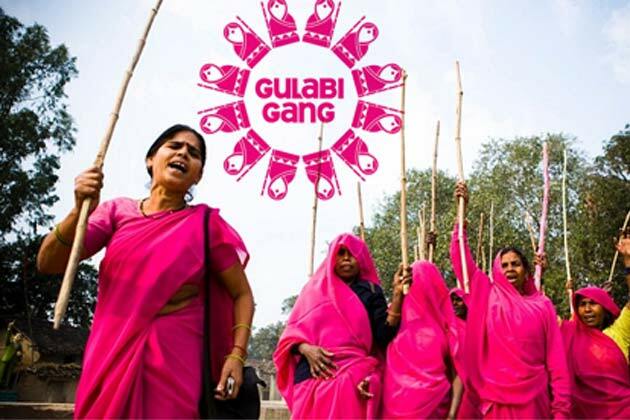 Also known as the Gulabi Gang, this grassroots, 10,000 women-strong, women-led movement in India has developed in response to widespread domestic abuse and other violence against women. These modern day women warriors, wear pink saris, symbolizing strength and arm themselves with bamboo sticks, for weapons. Their fight for social justice on behalf of oppressed and abused women, uses and teaches physical self-defense and empowers women with community outreach efforts in rural India. Join us for a screening of the documentary revealing their resistance tactics. After the screening we will discuss what we can learn from our sister-warriors in pink saris and how to apply this to sexual violence prevention work in our communities. This entry was posted on June 11, 2015 by Norris Thomlinson.